February 10th is the next #memtech Coworking Day. Traditionally we meet for breakfast somewhere and then go cowork together at Cowork Memphis. 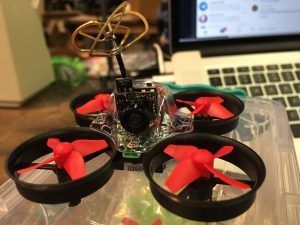 This February we’re trying an experiment to bring the event to MidsouthMakers. This also coincides with a cookout that MidsouthMakers is already planning for February 10th. We’re changing our Member Storage Policy. Currently you are able to lease space to store your items at the space for $10 a month. The pricing isn’t changing. Currently “Open slots are free to use by any member but are communal and not private” This is changing to: Open slots will no longer be used as communal storage. Anything in a section that is not currently being leased will be moved to the Lost and Found rack, or the Catacombs. This Friday 1/20 we’ll be cleaning out the open slots (with items going to the Lost and Found Rack or Catacombs). If you have anything in this communal storage area please make plans to collect them from the space this Friday or at your earliest convenience. We’re implementing a Lost and Found system. Lost and Found will also serve as a place that members can move a project that is unlabeled to a safe storage place so the owner can reclaim their project. Remember that we have dedicated member storage and you are expected to utilize this instead of a random nook or cranny in the space to store you projects. If you do need to leave a project or belongings at the space you are expected to leave a note with at least your name on it. If you do not do this you may find your project in the Lost and Found rack. 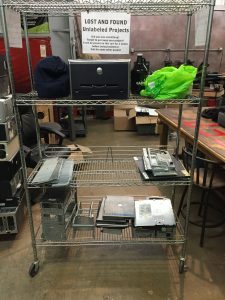 If you come into the space and you have to move things to free up a working space, move the things to the Lost and Found rack. If you come into the space and can’t find something you left, check the Lost and Found rack! Every 2 weeks (or less) the Lost and Found rack will be completely wiped clean. Everything on it will go into the garbage or salvaged for parts. Please make sure you are checking the Lost and Found rack each time you visit the space in case you have misplaced or forgotten to label a project. Don’t leave your stuff at the space without a note on it. Lose something? Check the Lost and Found rack. 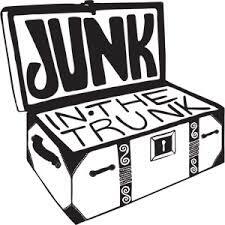 Got some junk in your trunk you’re looking to unload? Think MidsouthMakers may have a good use for it? Check out our newly revamped guidelines for Donating Items to the space!